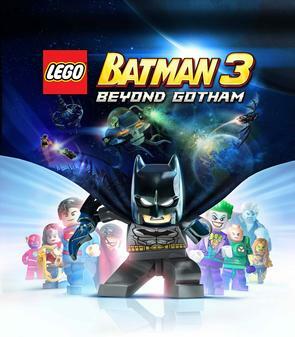 Hello, my name is Charles and I’m here to review LEGO Batman 3: Beyond Gotham for the Playstation 4. This is the third LEGO Batman videogame which also in turn celebrates the Batman franchises 75th anniversary. The protagonists in this game are Batman (Suits: Standard/Sensor/Power/Sonar/Space/Arctic/Electricity/Scuba), Robin (Suits: Hazard/Techno/Illumination/Diver/Helmet/Magnet/Sphere), Green Lantern, Martian Manhunter, Cyborg (Forms: Demolition/Sonar/Space/Stealth/Magnet/Giant/Electricity), the Flash, Superman, Wonder Woman, Plastic Man, Ace the BatHound, Aquaman, the Atom, Batgirl, Black Canary, Blue Beetle, Booster Gold, Dr. Fate, Etrigan, Green Arrow, Hawkgirl, Hawkman, Krypto the SuperDog, Nightwing, Orion, the Question, Red Tornado, Shazam, Stargirl, Supergirl, Zatanna, the Huntress and Vixen. The antagonists in this game are Killer Croc, the Joker (Outfits: Decoy/Demolition/Electricity/Flower/Illumination/Magnet/Sphere), Lex Luthor (Suits: Giant/Hazard/Decoy/Shield/Space/Stealth/techno), Cheetah, Firefly, Solomon Grundy, Bane, Black Adam, Black Manta, Brainiac, Captain Cold, Catwoman, DeadShot, DeathStroke, DoomsDay, Giganta, Harley Quinn, Kalibak, Killer Moth, Lobo, the Mad Hatter, ManBat, Metallo, Mr. Freeze, Parasite, the Penguin, Poison Ivy, Red Hood, the Riddler, Sinestro, ToyMan, Ultra-Humanite, Darkseid, General Zod and Killer Frost. In conclusion, I found that this game shows Batman at his most finest moments in history. Thus I say “Hail to the Dark Knight/Caped Crusader forevermore”.